"More Creatures" adds new creatures of great diversity into the game! 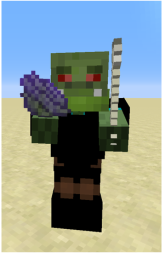 Each of these creatures have special drops, and are found in different biomes. 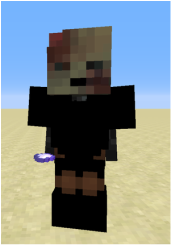 Type /say @e[tag=MoreCreature] to see a list of all the custom mobs currently present in your world. - Click the button prompting the install the module. Attacks: Sword, bow, blinding pocket sand. Drops: Katana which can be used to poison mobs. Health: Requires to be blown up by TNT about 5 times. Otherwise, 600 health. Attacks: Slows down the player, summons minions, bone, detonates near arrows. Drops: Blight bone. Hold while jumping to launch things sky high. Attacks: Sprints towards far players. Stops nearby players from jumping. Drops: Creepdeath bone. Hold to spread zombies around the player or banish them when in caves. Also enchanted with smite, is unbreakable, and has a fast cool down. 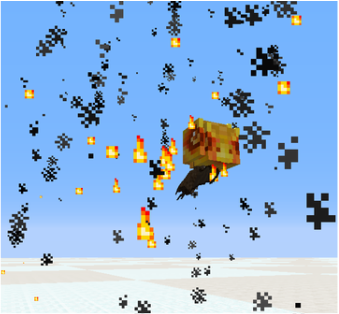 Attacks: Fires TNT, angers nearby pigmen, arrow shower, summons minions. Drops: Fire bat. Use to summon ring of fire and give fire resistance. 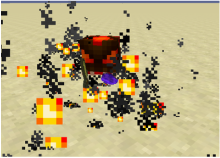 Attacks: Fire rings, lightning, healing (if you get close), gravity toss, summon creepers..
Drops: Mage's wand. Has fire aspect, used to kill wisps. Drops: Monkey head. Gives speed, jump boost, and weakness when worn. Attacks: Standard. Breaks surrounding blocks. Drops: Ogre flesh. Hold it to give haste level 100. Spawn: Snowy areas - Extremely rare. 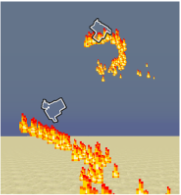 Damage: Fire damage to mobs. Attacks: Burns mobs. 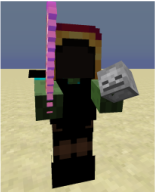 Levitates mobs. Drops: Nothing upon death. You can capture it by shooting an arrow at it - not too hard though otherwise it will die. If it explodes, it will drop a Phoenix egg which can be deployed at any time. Health: Invincible. Kill it by forcing it to walk over soul sand. Drops: Skitter's Bone. Hold to poison your enemies. and get jump boost and speed. If the Skitter kills you. It will likely destroy your items. Be careful. It is very deadly. Health: 30 in bat form. 600 in human form. Attacks: Standard. Changes from human to bat. Drops: Vampire fang. Touching it gives you vampirism [speed, jump boost, resistance, hunger]. Cure it by removing the fang, and sitting in a full cauldron surrounded by fire with an iron block under the cauldron. Health: Invincible. Vulnerable in the presence of a mage's wand. Speed: Medium. Will not track player. Attacks: Poison if you get close, levitates the player. Drops: Wisp dust. Has a hidden purpose. This is an "expansion" which comes with the module. Each mob has a chance of being angry. 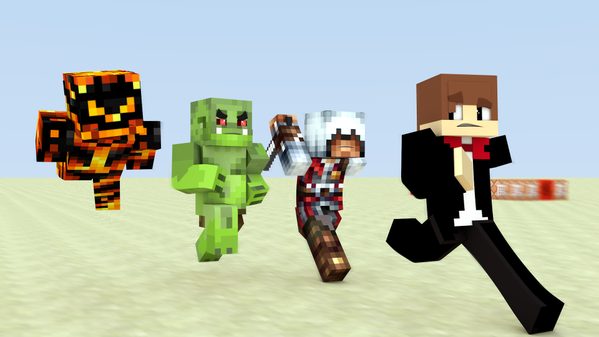 Angry mobs include Creepers, Skeletons, Spiders, and Zombies. 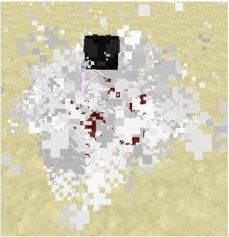 These mobs can spawn anywhere. Creepers: Have a Fuse of 10 instead of 30. Spiders: Place web all over you. Zombies: Summon baby zombies if you get too close. If you have the "Curses" mod installed, these guys are DEADLY. Skeletons: Swarm you with tonnes of arrows if you are 5 blocks away from them.